Welcome to Pioneer Talks Crops. This information is provided by the Pioneer agronomist serving your community. 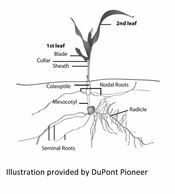 Making assessments of plant health and decisions on herbicide application depends on your ability to identify the parts of a corn seedling. 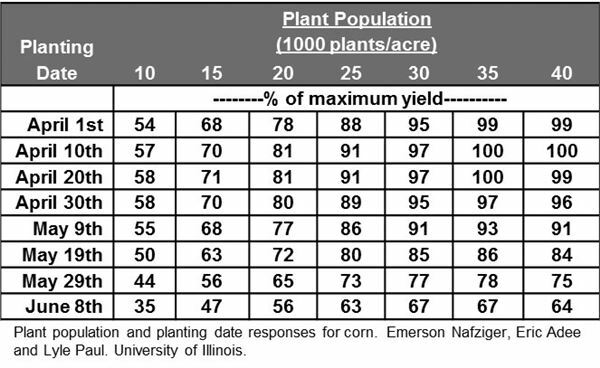 Knowing the proper growth stage of corn is critical. To determine corn leaf stages, count the leaves that are fully emerged from the whorl with the collar visible. Corn in the four-leaf stage will typically have six leaves visible, but two of the leaves will still be partially in the whorl with the collar not yet visible. A corn plant with six visible leaves, but only visible collars on the lower three leaves would be a V3 corn plant using the leaf collar method. Growth staging is very critical for the application of post-emergence herbicides. Read herbicide labels carefully for height limitations. Some labels will use slightly different staging methods or use plant height. In places where weed resistance is an issue, look at herbicide choices other than a total post program and other methods of cultural weed control. Follow the principles of good weed management. Be more active and diligent managers of fields and hit weeds at the right size. Avoid potential problems. Weed resistance issues can go from barely noticeable to infested fields within a few seasons, especially with prolific seed producers such as waterhemp, common lambsquarter and pigweed. They are capable of producing more than 100,000 seeds per plant. Studies show it can take 12 years to reduce the seed bank of lambsquarter by 50 percent.